Of all the celebrities who served their country during World War II -and they were legion -Jimmy Stewart was unique. On December 7th, when the attack on Pearl Harbor woke so many others to the reality of war, Stewart was already in uniform - as a private on guard duty south of San Francisco at the Army Air Corps Moffet Field. Seeing war on the horizon, Jimmy Stewart, at the height of his fame after Mr. Smith Goes to Washington and his Oscar-winning turn in The Phadelphia Story in 1940, had enlisted several months earlier. We would have made Jimmy a group commander [equivalent to an army regiment] if the war had lasted another month. - General Jimmy Doolittle. An excellent biography of a distinguished airman and fine human being. - Roger Freeman, author of The Mighty Eighth: A History of the U.S. 8th Air Force. How wonderful it is that Starr Smith has finally directed a literary light on the personal history of Jimmy Stewart. . . . I welcomed Starr's book. It is needed and wanted. Bravo! - Gay Talese. This is a very well researched and written book. . . . It fills a place in history about no mere actor but a courageous and selfless man, Brigadier General Jimmy Stewart, USAF. - General Michael E. Ryan, former Chief of Staff of the Air Force. 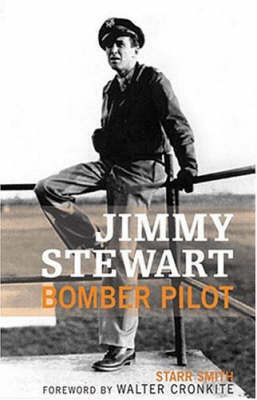 Buy Jimmy Stewart by Starr Smith from Australia's Online Independent Bookstore, Boomerang Books. Starr Smith is an international journalist and author who has chronicled his adventures to more than one hundred countries. Smith was a combat intelligence officer with the Eighth Air Force in England during World War II, and later served on General Eisenhowers press staff at his London and Paris headquarters.After the war, Smith worked with the militarys top brass, including Anderson, Arnold, Doolittle, Eaker, Kenney, Spaatz, and other great World War II leaders and generals. He has been a correspondent for NBC Radio, a reporter for Newsweek, and his byline has appeared in newspapers and magazines from six continents.Smiths books include Only the Days are Long and Starr Smiths Southern Scenes. He lives in Montgomery, Alabama.Starr Smith is an international journalist and author who has chronicled his adventures to more than one hundred countries. Smith was a combat intelligence officer with the Eighth Air Force in England during World War II, and later served on General Eisenhower's press staff at his London and Paris headquarters.After the war, Smith worked with the military's top brass, including Anderson, Arnold, Doolittle, Eaker, Kenney, Spaatz, and other great World War II leaders and generals. He has been a correspondent for NBC Radio, a reporter for Newsweek, and his byline has appeared in newspapers and magazines from six continents.Smith's other books include Only the Days are Long and Starr Smith's Southern Scenes. He lives in Montgomery, Alabama.